We collect a variety of types of personal information including: Name, address, phone number, email address, purchase information (items, address, payment information), fishing preferences, and profile/account information. Your profile and account information can include your account password, items in your cart, and any communications you may have with us. While browsing our website we may also obtain: information regarding your phone, tablet, computer, or other device, and online browsing activity. Information may also include your IP addresses, device identifiers, cookies identifiers, location, geo-location data, and Internet service provider information. We collect information on our website, through email or other written correspondence with you, and during email exchanges. We also obtain information from you and from third parties. We collect and obtain information: from third parties, such as service providers that we use, analytics companies, advertising networks, demographic parties, and other third parties that provide us with information about you. 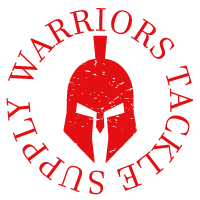 We also collect information from social media platforms and networks you use in connection with warriorstacklesupply.com (e.g. Facebook, Twitter, Youtube, Pinterest, and Instagram). We use the information that we collect to conduct our business and to provide you with the products and services that we may think would be of interest to you. The information can also be used to respond or communicate with you, fulfill your orders, maintain your service, for marketing & advertising, analytics, business purposes, and for legal, contractual and safety purposes. In general, we do not share personal information about you with third parties for their own direct marketing or advertising purposes unless you request or consent to such sharing, or as otherwise described below. We do share personal information with third parties for other purposes. We share personal information with our affiliates, parents, subsidiaries to perform actions allowed under this policy, third parties and service providers that provide products or services to us, that can assist us with marketing or advertising to you, including Social Media (Facebook, Twitter, Instagram, etc.). We work with third party companies for advertising purposes, including to: serve advertisements across the Internet; track and categorize your activity and interests over time on our website, and on third party websites and mobile applications; and to identify the different device(s) you use to access websites and mobile applications. We share information with these companies, and these companies may collect information, including automatically collected information when you use our website. These third party companies also may possess or obtain information about you from your interactions: directly with the third party companies; with other websites, mobile applications, or companies that the third party companies work with; or from your interactions with advertisements the third party companies help to display to you. The information that these companies collect or that we share may be used to customize or personalize the advertisements that are displayed to you. We use Google Analytics, AdRoll, and other third parties to measure and report how users interact with our website, emails and advertisements to analyze the traffic to our website and for the other purposes. Our website may provide links to other Internet sites, content or videos (embedded or direct links) maintained by third parties. We are not responsible for the sites, content, or videos accessed via the links, and we have not reviewed the privacy practices of those third parties. Any changes to the policy will be updated here. We will notify you by posting the updated Policy on our website and update the effective date at the top of this Policy. By continuing to use our website after being notified of material changes to this Policy, you agree that the terms of this Policy as of the effective date will apply to information previously collected or information that could be collected in the future.